Because God Counts Her Tears. Every Tear A Woman Shed Is Equivalent To Mans Sacrifices In Life. But From The Side To Be Equal. And Next To The Heart To Be Loved." I hope you accept the real me. And if you don't. Good luck trying to change me. 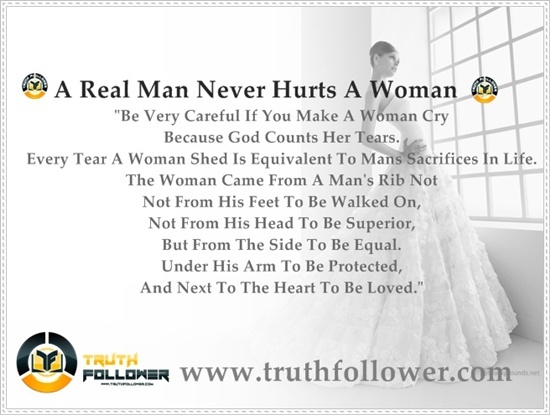 A Real Man Never Hurts A Woman picture/image is an Inspirational Stuff to Inspire and Motivate You. You can download pics by just clicking on the Images. Thanks for visiting Truth Follower an online place for huge collection of inspiring pictures, quotation, and Sayings Images. If you like A Real Man Never Hurts A Woman , Please Share with friends and family on Facebook, Twitter, and Pinterest. Get more quotations like this In your inbox!